Hold on to your hats, folks, as what I'm about to say may just may blow them of your pretty little heads. I ... have ... finished one of my "Bye-Bye, Backlog" games! I finished it--Dragon Quest Heroes: Rocket Slime, that is--yesterday, in fact. And when I say I finished it, I don't just mean that I beat the final boss; I also mean that I rescued all 100 of my slime-napped friends. As for how long it took me to accomplish this feat: putting the game's antagonist, Don Clawleone, in his place, once and for all, pushed my playthrough past the 20-hour mark. This post nearly wasn't so celebratory, by the way. That's because I was this close to giving up on Dragon Quest Heroes: Rocket Slime early in the week--after I became hopelessly stuck on a specific late-in-the-game tank battle. I sped around that bump in the road after re-tooling my tank and re-configuring my crew, though, and then gleefully raced through the rest of this wonderfully captivating game. 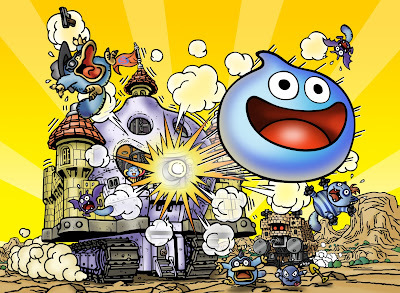 Unsurprisingly, I'm still playing the game, even though there are no more slimes to rescue and no more tanks to beat to smithereens (well, other than those that are part of the Tank Masters Tournament). That's how much it has wormed it's way into my heart. I'm going to continue enjoying Dragon Quest Heroes: Rocket Slime--and Fire Emblem: Awakening (which I have to sheepishly admit I've yet to start)--through the end of this coming week, and after that I'll switch to my next "Bye-Bye, Backlog" selection, which at the moment I'm thinking either will be Half-Minute Hero (PSP) or Super Mario Sunshine (GameCube). In the meantime, feel free to share your heartfelt opinions of Dragon Quest Heroes: Rocket Slime in the comments section below. As for Rocket Slime, I think I'm definitely going to have to check it out one of these days! Thanks, Anne! And, believe me, I'm not trying to compete with you when it comes to our respective backlog projects. I have a feeling I'm going to finish very few of my selections during the allotted time--in fact, this may be the *only* one I'm able to finish. We'll see. Also, thanks for chiming in on which game you'd like me to play in March. I know I didn't explicitly ask for peoples' opinions on the matter, but I definitely hoped people would share them anyway. At the moment, I'm leaning toward Super Mario Sunshine--just because I tend to like 3D Mario games and I can't believe myself that I've never played this one. Also, like you said, it'll be interesting to see if I end up disliking it (like some folks) or enjoying it (like Justin, I believe). Will you plan on getting around to both Half-Minute Hero and Super Mario Sunshine over the next 10 months, regardless of which you pick to play in March? Also, yes, I'll definitely be playing both Half-Minute Hero and Super Mario Sunshine sometime in the next 10 months. Those games are "locks," as far as I'm concerned. I'm also definitely going to try to finish playing Deadly Premonition and Xenoblade Chronicles in that time. Not sure which other ones will make the cut, though. Do you have a pretty set schedule for your backlog project at the moment, or are you kind of winging it, too? Congratulations on finishing Rocket Slime! It was a great game, but I've admittedly not played it in years. I've not played it since shortly after it came out in America, but I remember having a lot of fun with it. But, I didn't really bother with any of the extra side stuff... I'm not sure why, but I'm guessing I just had a ton of games on the backlog I needed to burn through. ...I guess some things never change in that regard, eh? Congrats! That's awesome! Glad you loved it. Umm...I just started Half-Minute Hero, too. I'm sort of...meh...about it so far. Play Super Mario Sunshine! Thanks, Espiga! There's nothing wrong with not doing the side stuff in this game. I only did it myself because I loved the rest of the game so much and I wanted to see all that it offered. Thanks, Justin :) Which version of Half-Minute Hero are you playing, by the way? The PC/Steam version? I don't think you have a PSP or 360, do you? As for Sunshine: yes, that's probably what I'll play.